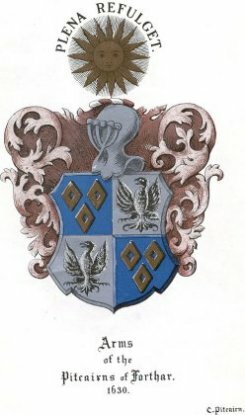 Isabelle, daughter of Henry Pitcarne, laird of Pitcarne and Forthar, married Patrick, fourth Lord Lindsay of the Byres before 1480. The Lindsays were very distinguished in Scottish history. Isabella Pitcarne, Lady Lindsay, lost her son David of Kirkforthar at the battle of Flodden Field 1513. Isabella, Lady Lindsay, had two charters in her favour. Lord Lindsay was at the battle of Flodden in 1513. He was one of the guardians appointed afterwards to take care of the young king, James V. He died in the year 1526.